Enjoy your week. I love to read. I review books. I love Nora Roberts too. I'd love to read you works. But they are in Dutch? That is cool. I hope you manage to get your characters sorted out. It was nice meeting you today at HHM. I linked too. loved reading about your thoughts, I'm glad you figured out what you want your characters to do. I love that you are focused and having fun. I have so much to do for the Thanksgiving holiday and I hope I am ready in time! Hope you do finish in time and have a wonderful Thanksgiving! What a beautiful photo! How interesting to be a writer! glad to hear the thoughts are flowing. I love Nora Roberts too! Hope you have a Happy Thanksgiving. I haven't had beef stew in ages! Enjoy your week! i think i will take this list today - and use it on my blog - because it is monday, and i am at home. it sounds like you got your renovations cleaned up in time for sinterklaas celebrations. i hope today is merry and bright for you! 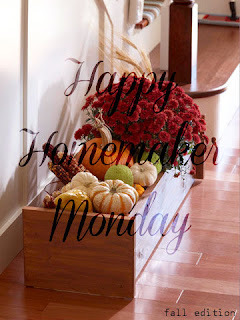 I'm so sorry I'm only now coming by to say hi, but it's been so crazy around here :) Welcome to the Happy Homemaker Monday, so glad to see a new face. I enjoyed reading your list. I also enjoy Nora Roberts so it was nice to see someone else who enjoys her just as much.